The RME Fireface 802 is described as a full-blown studio within a 1U enclosure, with up to 60 channels of audio, FireWire and USB connectivity, powerful monitoring software and four well-regarded microphone/instrument inputs. Huw Price sparks up. The Fireface 802 represents an upgrade on the Fireface 800 in several respects. Besides the updated appearance, extra channels and USB 2 connectivity, most of the latest features revolve around the TotalMix software. 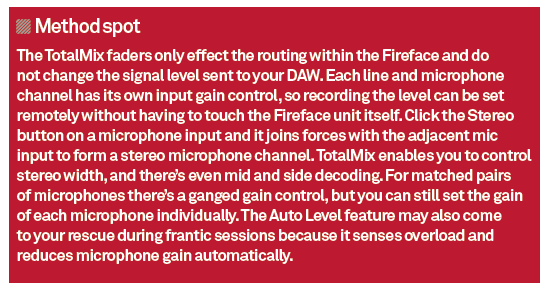 Although this is ostensibly a review of the Fireface 802 all owners will be obliged to use the TotalMix package to a greater or lesser extent, so we’ll be covering that too. 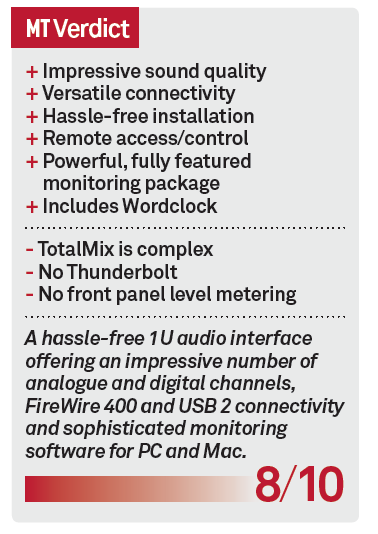 First let’s look at the basic specs of the hardware before we tackle the intricacies of TotalMix. The Fireface 802 provides up to 30 input and 30 output channels (depending on the sample rate) with a maximum of 12 analogue and 18 digital channels able to be recorded onto 30 tracks. Analogue connections include eight balanced TRS sockets at the rear for line level and four microphone inputs on the front panel. 12 analogue outputs are split between eight TRS jacks on the back and two stereo headphone outputs on the front. Level options include -10dBV, +4dBu, HiGain (equivalent to +2dBV, +13dBu and +19dBu). All outputs can be used for ASIO Direct Monitoring (ADM) purposes. 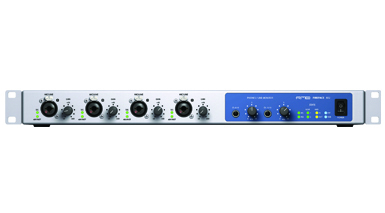 The 802’s microphone and instrument preamps are based on those in RME’s high-end OctaMic II. With XLR/TS combo sockets, up to 60dB gain is available for microphone and Hi-Z inputs. The TotalMix software provides individual phantom power and phase switching. 16 additional analogue inputs can be connected via dual eight-channel ADAT optical I/Os and an AES/EBU I/O operating at up to 192kHz provides an additional two channels. The second ADAT I/O can be used as optical SPDIF I/O. BNC Wordclock input and output and MIDI I/O complete the list of connections. 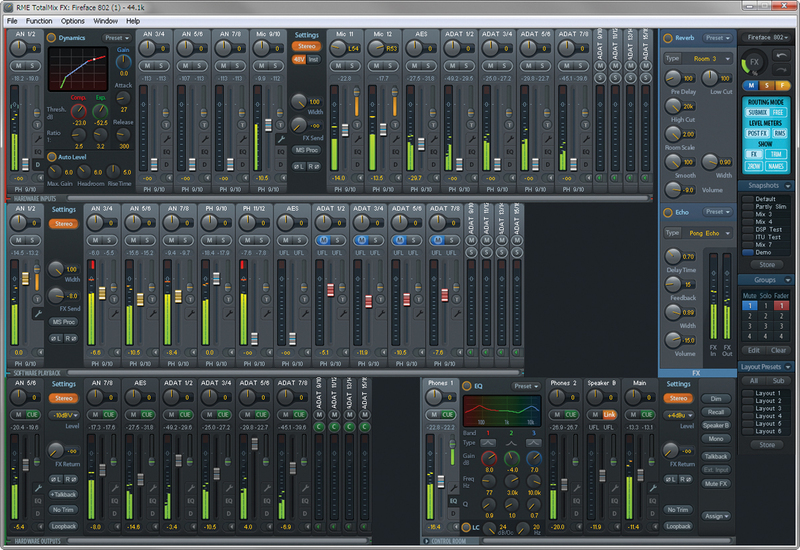 Essentially the dual DSP-driven TotalMix software is designed to route anything you want to anywhere you’d like. 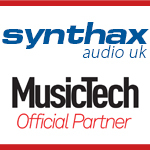 Up to 15 fully independent stereo submixes are possible, along with a Control Room section that provides many of the features found on desktop controllers, such as monitor, mono/stereo, dim and talkback switching. This section also controls the two headphone outputs. Every input and output channel has a three-band parametric EQ, adjustable low cut, auto level overload protection, compressor, expander and MS (mid and side) processing. Effects can be applied to signals on the way in or out, and you can even process the input signal for monitoring purposes while recording the un-processed signal. Each input channel has a single effects send for reverb and delay, and every output channel has an effects return fader. So you can add reverb to one or both headphone mixes while maintaining a dry sound in the main monitor mix. The send feeds both effects equally and they can be activated individually or together. The balance between them can be altered using their individual volume controls, but since there’s only one ‘auxiliary send’ some degree of compromise is inevitable. Even so, it’s an effective way of providing a singer with some ‘confidence’ reverb or delay while sending a dry signal to the DAW. DSP inside the Fireface takes care of all the signal processing and effects duties, leaving your computer to take care of recording and playback. Four groups are provided for solo, mute and faders, and trim mode adjusts the volume for all routed signals of a channel simultaneously. Most functions of TotalMix can be controlled remotely via MIDI with a compatible Mackie Control controller. TotalMix FX also supports OSC and the use of multiple remotes. TotalMix provides three banks of faders controlling hardware input, software output and hardware output. Any signal can be routed anywhere within the system and in any combination. For instance, a hardware input signal can be routed direct to any number of hardware outputs for zero-latency monitoring. Levels and panning for every output can be set independently, so it’s easy to configure various different monitor mixes. Sonic differences between digital converters are occasionally exaggerated or over-emphasised when products competing at similar price points are compared. Having said that, differences between the RME and our somewhat cheaper interface were clearly apparent. Installation with a MacBook Pro was problem free and we set up an aggregate device with the RME and our industry-standard mid-price interface, which enabled us to swap between them instantaneously. This revealed that the bass end of the RME was tighter, faster and cleaner and the treble region had a crisper and airier quality that was most apparent on hi-hats and picked acoustic guitar. The RME also had a more ‘up front’ quality, despite the soundstage having greater depth. Next we split a microphone signal to compare the different mic preamps. Signal splitting ensures that the preamp is the only variable and we found that the RME recordings had a far clearer midrange and a more ‘realistic’ tonal quality. In comparison, our mid-price interface sounded mushy and a bit muffled. The effects are best described as decent and functional rather than ground breaking. RME provides plenty of factory presets that should get you up and running quickly, plus you can store settings that you have dialed in yourself. They’re certainly good enough for basic mixing duties and they do enhance input signals without forcing you to commit to processing that you may regret later. So it’s a thumbs up on the sonic side, and the RME Fireface 802 certainly qualifies as an upgrade from entry-level and semi-pro interfaces. Having said that, TotalMix adds a degree of complexity that will require some commitment if the user is to make full use of its processing power. The range of features on offer impresses, however many will be surplus to requirements for those mixing in Pro Tools or Logic, and some may find the dark and cluttered appearance of the user interface a bit off-putting. The manual is hefty and difficult to navigate. The UK distributor assured us that all the necessary information is in there and they have also produced a couple of in-depth tutorials that can be found on YouTube. They’re effective and show you everything you need to know. Once you get your head around TotalMix it’s a very powerful and practical tool that can be used for monitoring while recording, mixing off a DAW or even as a virtual mixer for live shows. It complements the hardware making the 802 an attractive package overall.